Top of mind for most of us in the coffee industry these days is the growing concern about the Roya disease, also know as Coffee Rust, and its impact on next year's specialty coffee supply. Earlier this month the Guatemalan government and the Guatemalan National Coffee declared a state of emergency citing an expected 15% loss to the 2012-2013 harvests. Other countries in Latin America are equally at risk, with parts of the Chiapas region in Mexico facing a potential 60-70% loss, according to several general managers our Oaxaca team has met with. The disease is expected to significantly impact all actors across the supply chain - reduced supply of high quality coffee for roasters resulting in higher prices for consumers and loss of income for more than 200,000 smallholder farmers who depend on coffee income to support their families. As with most budding crisis situations, there is a lot of noise but little clarity about what to do. We are hearing the chemical companies are having a bonanza day selling farmers all sorts of fungicides and stories of rampant spraying have traveled quickly. 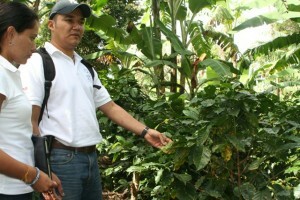 Obviously, the use of potent chemicals is not an option for organic coffee farmers since commercial fungicides do not comply with certification standards. The reality is that even for farmers of conventional product, fungicides are not a silver bullet. 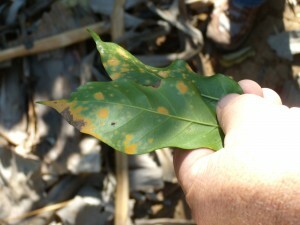 In fact, they can actually perpetuate the conditions that make coffee plants more susceptible to disease. Several weeks ago we started reaching out to our producers in order to assess the situation and provide guidance on how best to mitigate the impact. Claudia Rocio Gomez, our quality manager headquartered in Medellin, is visiting producers in Honduras and Nicaragua this week. Recognizing there is no way to kill Roya once it has infested a plant, our emphasis has been (and will continue to be) on what can be done pre- and post- outbreak - specifically around strengthening crops to mitigate susceptibility and, in the event of infestation, facilitate fast recovery in order to quickly return to historical quality and yield standards. Our agronomists are focused on an integrated management strategy that takes into account the importance of shade, pruning, weed control, density, organic composting, choosing disease-tolerant varietals and regular sampling both pre and post disease. We're in the process of compiling a new chapter dedicated to Coffee Rust for our Best Agricultural Practices iBook for producers. But we realize the severity of the situation requires multiple conversations with myriad stakeholders in order to have a real impact. As such, we're planning a summit-level session at this year's Let's Talk Coffee® Peru slated for the second week of May and are working collaboratively with other industry leaders. Our commitment is to communicate often in order to make sure all of our supply chain partners are well informed on the latest Roya developments. So keep an eye out for blog updates and other communiques. But most of all, we're encouraging our customers to call us to discuss Roya's impact on future orders, and our producers to reach out to their Sustainable Harvest® contact(s) to discuss ways to adopt integrated management methodologies.